Play New York Times Roulette! NYTimes.com gets some extra clicks today. Here’s a fun game: New York Times Roulette! Just click the button at the top of the page. A link will take you to a random article published within the last 24 hours on NYTimes.com.Daniel Vydra, a software developer for The Guardian in London, created a similar program for their news site. 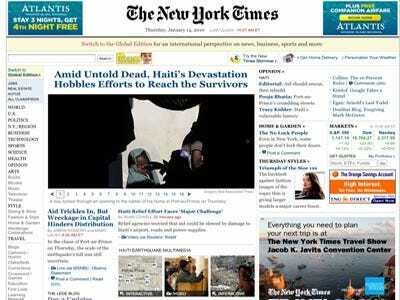 He then re-purposed it for The New York Times, using the Times’ Newswire API and Google’s app engine. This is just one example of why releasing APIs is a good idea for news organisations: Developers can play with your data and create interesting applications that direct users to your sites. As Mathew Ingram at GigaOm notes, an application like this Roulette game might help traditional media outlets think about new ways to present and consume content.